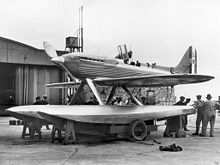 The Supermarine S.6B was a British racing seaplane developed by Reginald Mitchell for the Supermarine company to take part in the Schneider Trophy competition of 1931. 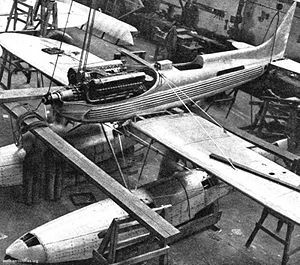 The S.6B marked the culmination of Mitchell's quest to "perfect the design of the racing seaplane" and was the last in the line of racing seaplanes developed by Supermarine and followed the S.4, S.5 and the S.6/S.6A. The S.6B represented the cutting edge of aerodynamic technology and "Mitchell's experience in designing the Schneider Trophy floatplanes provided him and his design team with valuable experience in producing high-speed aircraft," greatly contributing to the development of the later Spitfire fighter. Despite previous British victories, in 1930, the Air Ministry following a decision from Prime Minister James Ramsay MacDonald, stunned the Royal Aero Club, sponsors of the country's Schneider Trophy entries, with the announcement that no further government funding was to be offered. A public subscription of several million pounds resulted and after pressure by Lucy, Lady Houston and several newspapers, the British Government belatedly agreed to support the Royal Air Force's entry to defend the trophy. There were only nine months to prepare, consequently Supermarine's designer, Reginald Mitchell, could only update the S.6 airframes that had won the trophy in 1929. An abortive attempt to address the high speed in alighting resulted in a proposal to convert the S.6 to a biplane configuration. This proposal did not proceed further than a "paper" project and was cancelled in the rush to redesign the earlier racer. A major improvement in performance was obtained when Rolls-Royce increased the power of the R-Type engine by 400 hp (298 kW) to 2,300 hp (1,715 kW). Although the British team faced no competitors, the RAF High Speed Flight brought six Supermarine Schneider racers to Calshot Spit on Southampton Water for training and practice. The aircraft were: S.5 N219, second at Venice in 1927, S.5 N220, winner at Venice in 1927, S.6A N247, that won at Calshot in 1929, S.6A N248, disqualified at Calshot in 1929, alongside the new and untested S.6Bs, S1595 and S1596. The improved aircraft was designated the Supermarine S.6B to differentiate the variant from the S.6A. The British plan for the Schneider contest was to have S1595 fly the course alone and if its speed was not high enough, or it encountered mechanical failure, then the more proven S.6A N248 would fly the course. If both S1595 and N248 failed in their attempts, N247 held in reserve would be used. The S.6B S1596 was then to attempt the World Air Speed Record. During practice, N247 was destroyed in a fatal takeoff accident, precluding any other plans with only the two S.6Bs and the surviving S.6 prepared for the final Schneider run. The winning Schneider flight was piloted by Flt. Lt. John N. Boothman in aircraft serial number S1595 at a speed of 340.08 mph (547.19 km/h), flying seven perfect laps of the triangular course over the Solent, between the Isle of Wight and the British mainland. Seventeen days later, Flt Lt. George Stainforth in S.6B serial S1596 broke the world air speed record reaching 407.5 mph (655.67 km/h). At the completion of the record flights, both S.6Bs were retired, with the Schneider Trophy winning S.6B S1595 donated to the Science Museum in London, where it currently resides in an unrestored state. For a short period of time, S1596 was tested at the Marine Aircraft Experimental Establishment (MAEE) at Felixstowe but its ultimate fate is unknown, although until the 1960s, S.6A N248 was displayed incorrectly as S1596 at Southampton Royal Pier as a visitor attraction. McKinstry, Leo. Spitfire - Portrait of a Legend. London: John Murray, 2007. ISBN 0-71956-874-9. Robertson, Bruce. Spitfire: Story of a Famous Fighter. London: Harleyford, 1962. ISBN 0-90043-511-9. Spick, Mike. Supermarine Spitfire. New York: Gallery Books, 1990. ISBN 0-8317-14034. Winchester, Jim. "Supermarine S.6B". Concept Aircraft: Prototypes, X-Planes and Experimental Aircraft. Kent, UK: Grange Books plc., 2005. ISBN 1-84013-309-2.